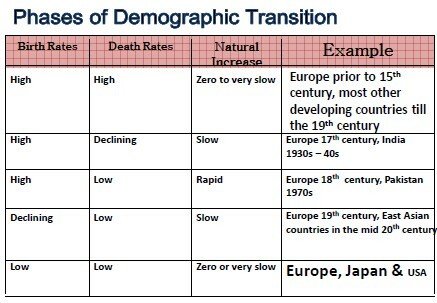 The Demographic transition model (DTM) is a model used to represent the process of explaining the transformation of countries from high birth rates and high death rates to low birth rates and low death rates as part of the economic development of a country from a pre-industrial to an industrialized economy. 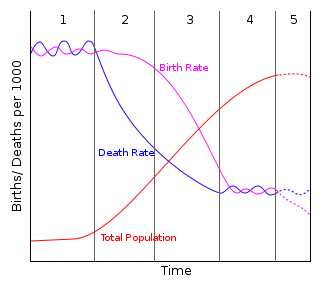 It is based on an interpretation begun in 1929 by the American demographer Warren Thompson of prior observed changes, or transitions, in birth and death rates in industrialized societies over the past two hundred years. • In stage one, pre-industrial society, death rates and birth rates are high and roughly in balance. • the birth rate is constant, while the death rate fluctuates due to manmade and natural disasters as famines, floods and wars. 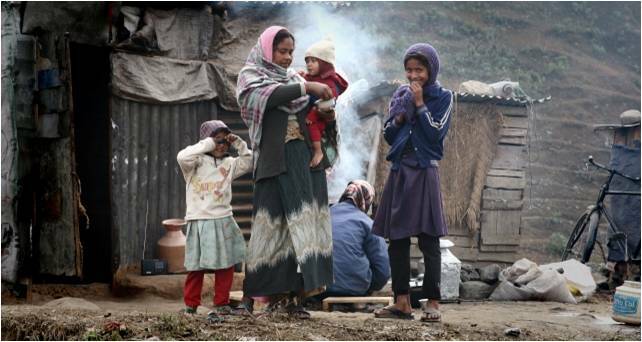 • In stage two, that of a developing country, the death rates drop rapidly due to improvements in food supply and sanitation, which increase life spans and reduce disease. These changes usually come about due to improvements in farming techniques, access to technology, basic healthcare, and education. Without a corresponding fall in birth rates this produces an imbalance, and the countries in this stage experience a large increase in population. • In stage three, birth rates fall due to access to contraception, increases in wages, urbanization, a reduction in subsistence agriculture, an increase in the status and education of women, a reduction in the value of children's work, an increase in parental investment in the education of children and other social changes. Population growth begins to level off. • As the large group born during stage two ages, it creates an economic burden on the shrinking working population. Death rates may remain consistently low or increase slightly due to increases in lifestyle diseases due to low exercise levels and high obesity and an aging population in developed countries. • Birth rates fluctuate, indicative of fertility control as people alter their reproduction according to socioeconomic changes. England was the first country to pass through the demographic transition. This took approximately 200 years. Some other countries, such as Japan, which started the process rather later than England, completed their passage through the transition in less than half that time. The extent to which this theory applies to less-developed societies today remains to be seen. Many countries such as China, Brazil and Thailand have passed through the DTM very quickly due to fast social and economic change. Some countries, particularly African countries, appear to be stalled in the second stage due to stagnant development and the effect of AIDS. In epidemiology: refers to a phenomenon in which the result or finding of the study does not reflect the truth of the fact. 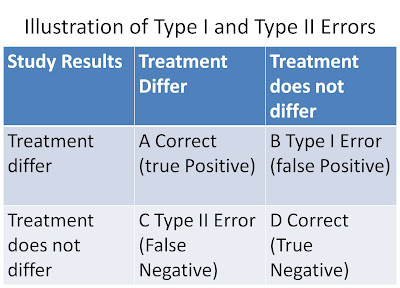 Error that generally occurs in sampling procedure. It is a divergence, due to chance alone, of an observation on a sample from the true population value, leading to lack of precision in the measurement of an association. This is called random error where the error is due to chance. The only way to reduce it is to increase the size of sample. How to reduce Random Error? Increase the size of the study. Any process or attempts in any stage of the study from designing to its execution to the application of information from the study which produces results or conclusions that differ systematically from truth. Most common type of bias. More intensive interview to desired subjects etc. It is distortion in true study finding due to improper information/lack of information or misclassification. Losses to follow up, attrition/experimental mortality, etc. The term “confounding” – effect of extraneous variable that entirely or partially explains the apparent association between the study exposure and the disease. It is a bias that results when a study factor effect is mixed, in the data, with effects of extraneous variable or the third variables. It is an independent risk factor (cause) of disease. It is not on the causal pathway between exposure and the disease. To ensure that health is an assets in the community. To equip the people with skills, knowledge and attitude. To promote the development and proper use of health service. It is a psychological principle that people are unlikely to listen to those things which are not to their interest. It should aim at encouraging people to work actively with health workers and others identifying their own health problems and also in developing solution and plans to work them out. In Health Education, we must know the level of understanding, education and literacy of people to whom the teaching is directed. Repetition at interval is extremely useful for understanding all the news. Every individual has a fundamental desire to learn. Stimulation or awakening of desire of learning called motivation. Health educators must be aware of the various barriers of communication and cultural background of the community. The Chinese proverb “if I hear, I forget. If I see, I remember. If I do, I know” illustrate the importance of learning by doing. a. exactly two emergency admissions will occur on a given day. b. no emergency admission will occur on a given day. c. either three or four emergency cases will be admitted on a given day. b. ten or more accidents. d. Fewer than five accidents. a. Between 180 and 200mg/100ml. a. wt of 3.9 kg as abnormal? b. wt of 2.5 kg as normal? a. more than 30 days? b. less than 20 days? 9. A health researcher wants to estimate the mean hb level in the community. Preliminary information is that this mean is about 150 mg/l with sd of 32 mg/l. if a difference of up to 5 mg/l in either side in the estimate can be tolerated, how many subjects should be included in the study? 10. An intervention programme for tobacco users is to be implemented in certain community. Find the required sample size when the proportion of tobacco user in the community is reported to be 20% by some other study and a difference of upto 3 in either side is tolerable. 11. In a length of hospitalization study conducted by several cooperating hospitals, a random sample of 64 peptic ulcer patients was drawn from a list of all peptic ulcer patients ever admitted to the participating hospitals and the length of hospitalization per admission was determined for each. The mean length of stay was found to be 8.25 days. If the population s. d. is known to be 3 days, can it be concluded that the mean hospital stay is more than 7 days, less than 9 days and different than 7 days. 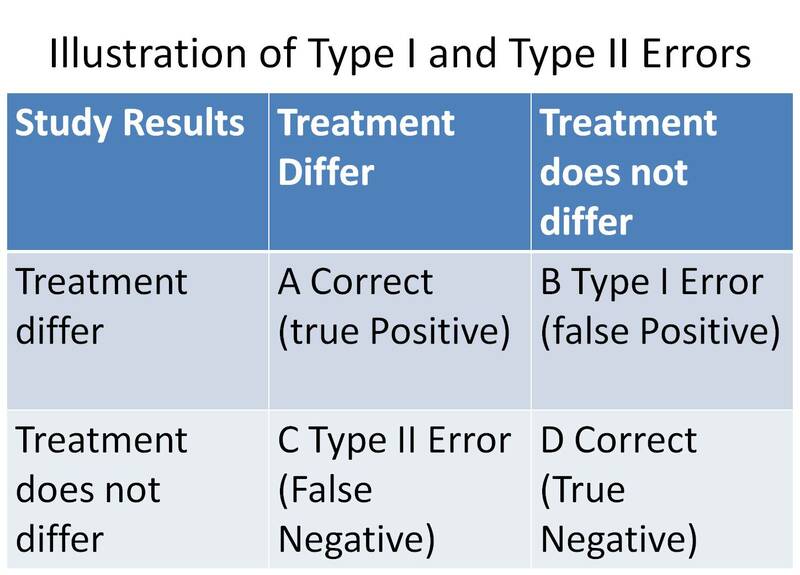 In the above problem, if population SD is not known and sample SD is 3 days and sample size is 25 records of patients, solve for all three conditions. 12. Protoporphyrin levels were measured in two samples of subjects. Sample 1 consisted of 50 adult male alcoholics with ringed sideroblasts in the bone marrow. Sample 2 consisted of 40 apparently healthy non alcoholic males. Can we conclude that protopophyrin levels are higher in alcoholic population than in non alcoholic? a) Let the populatiom s. d. for both is 1, solve using z test. b) Let the sample s. d. for both is 1, assume equality of variances and solve. Assume unequal variances and solve. 14. Can we conclude that chronically ill children tend on average, to be less self confident than healthy children? A test designed to measure self confidence was administered to 32 chronically ill and 32 healthy children. The mean scores and s. d. were as follows. 16. A sample of 500 college students participated in a study designed to evaluate the level of college students’ knowledge of a certain group of common diseases. The following table shows the students classified by major field of study and level of knowledge of group of diseases. 17. A study of 190 pregnancies yielded the following results on the relationship between hypertension of mother and a certain complication of pregnancy. Do these data suggest that the two conditions are not independent? 18. Determine if there is association between scabies amongst the school children and the socio economic status.